EdR, one of the nation's largest developers, owners and managers of high quality collegiate housing, today announced the commencement of construction on a multiple building living-learning community at Northern Michigan University (NMU). EdR was chosen by NMU through a competitive selection process to execute all aspects — development, finance, construction and management — of this project which will be the largest in the university's history. Rendering of EdR's on-campus living-learning community now in construction at Northern Michigan University in Marquette, Mich. Upon completion, EdR will operate the residence halls under a 75-year lease with NMU and will manage the facility while NMU will provide residence life services. EdR will finance the approximately $80 million housing development through its ONE PlanSM which uses the company's equity and financial stability to fund projects on university land. More than 1,200 beds will be delivered in multiple phases which are scheduled for delivery in the second half of 2017, and the fall of 2018. This systematic phasing will allow NMU to accommodate student bed count needs during construction. The new living-learning community will feature robust internet and Wi-Fi capabilities, classrooms, study rooms, TV lounges and laundry facilities. The large patio area, fireplaces and lobbies are designed to accommodate art shows, student events, university functions and various types of entertainment for residents year round. "I think the enhanced on-campus housing is an incredibly positive, transformative opportunity for Northern," said NMU President Fritz Erickson. "It is going to allow us to greatly strengthen our capabilities to recruit and retain students in today's highly competitive education environment, enrich student life and address a very serious facilities and maintenance issue." Northern Michigan University is a dynamic four-year, public, comprehensive university that features one of Michigan's premiere education programs and several other nationally recognized academic programs. "University leadership has made it clear that increased recruitment, enrollment and retention of top-level students is a priority at Northern Michigan University," said Tom Trubiana, EdR president. 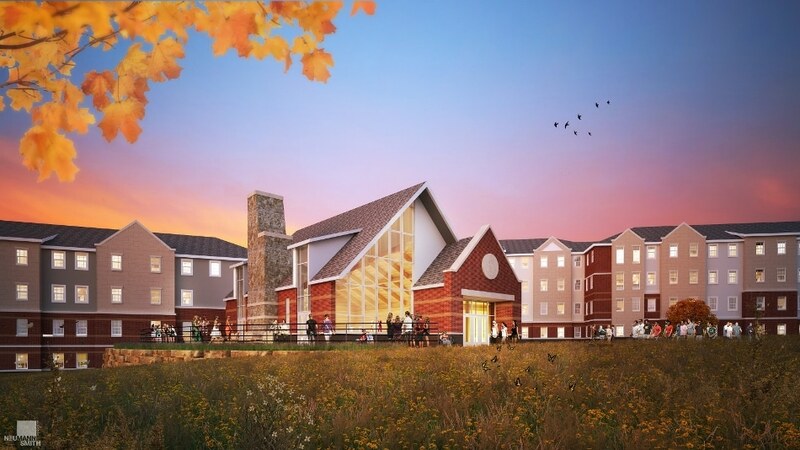 "Partnering with NMU provides EdR the opportunity to deliver another on-campus housing community that gives the university both a state-of-the-art home for many of its students and a recruiting tool that will compete with any in the nation."